Nicky Palmer, playing Britain of course, shows we colonials how it is done while collecting both Best Britain and the overall championship. What's Diplomacy without a little backroom negotiations? 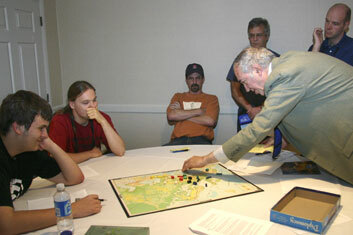 "Now listen, Joe, I have this boatload of tea in Boston - slightly damaged, I can let you have for a bargain price ... "
WBC 2007 was my first attempt at running a Diplomacy Tournament and it was the perfect venue to break the ice. I was able to provide plaques for the top seven finishers [Top Board] as well as the traditional blocks of wood for the 'Best Country' awards. 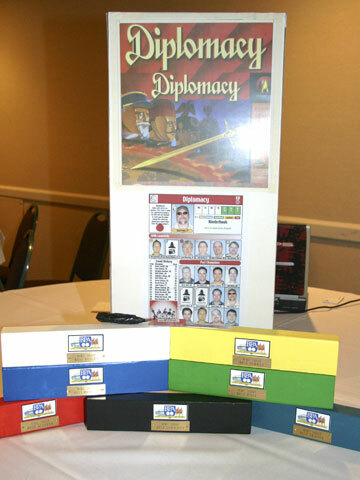 Diplomacy was scheduled in a separate "diplomatic" room for the tournament and it was greatly appreciated as the heated discussions carried on through the late night hours. The overall play for the weekend displayed lots of co-operation and very little stabbing. So little stabbing in fact that the 'Silver Shiv' award that I had created was saved until next year ­ there just wasn't a worthy stab during the event. There was one point difference between 1st & 2nd place while the difference between 3rd through 7th only added up to eight points total. Friday night we started off with two boards. Game 1 ended up as a 5-way [EFIRT] while game 2 ended up as a 4-way [EFIT] and produced Nick Palmer's Best England, Robert Vollman's Best France, Romain Jacques' Best Turkey & Gerry Fahrenthold's Best Italy. Due to being short a player, I held positions on both boards with Game 1 being my official score for the tournament. The other six players were more than happy to make my life easy and promptly booted my Austrian position from the board. Saturday morning dawned with but one board as players drifted in with their morning coffee. Co-operation seemed to hold strong as the game ended as another 5-way [EFGIT]. Sunday morning the tournament ended with two boards. The first game ended as a 6-way [AEGIRT] while the second ended as another 5-way [AEFGR] which produced T.J. Halberstadt's Best Germany & Paul Konrk's Best Russia. 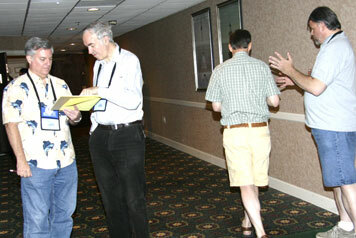 The end game draw discussions were entertaining to hear as players were pointing out the strengths in their positions. Since all surviving players had to unanimously agree to the draw vote, the discussions with the weaker positions centered on convincing them to agree to vote themselves out of the draw. One of the 'lines' heard above the din was, "You could cut the irony with a knife" as players learned the effects of arguing strongly on one side in one game and being on the other side in another game. To promote the multi-game atmosphere of WBC next year I will be modifying the tournament rules to the point where an individual can win this tournament while only playing in one round. The 6-8 hour time limits worked well and all games through random circumstances all ended prior to the 7th hour. This is a great place to play Diplomacy and I hope that the Diplomacy hobby notices this and puts us on their must-go-to list next year. It would be a real shame if the Yerkey-era years of consistently being one of the largest Diplomacy tournaments extant were allowed to become a distant memory and Diplomacy were to slip from the WBC menu altogether.